The 2017 Toyota Tundra is a tough pickup, with a lineup of six trims designed to appeal to even the pickiest truck driver. It’s also available in a regular cab, Double Cab or CrewMax. Except for the Double Cab, each option comes with a fixed bed length. Despite the focus on strength and comfort, design was not shuffled aside; the Tundra is available in many colors, including Blazing Blue Pearl, Barcelona Red and Inferno. The powertrain options in the Tundra include two i-Force V8 engines. Designed for off-road navigation, a full-time 4WD system is compatible with both eight-cylinder engines. When properly equipped, the Tundra can tow more than 10,000 pounds. The patented TripleTech frame is engineered to ensure a reliable connection with hitch receivers and other trailer installations. When it comes to digital technology, the Tundra has a lot to offer through the Entune multimedia system. Dozens of applications can be accessed in this signature hub that includes a 7-inch touch screen. Some industry-leading safety features in the Tundra include the Blind Spot Monitor and a sonar-based parking system. Equipped with 4×2 drive and a 4.6L engine, the 2017 Toyota Tundra SR starts at just above $30,000. An upgrade to the SR5 trim increases the price by about $2,000. You’ll need to spend just under $40,000 for the Limited trim. If you want the unique 1794 Edition, be prepared to dish out over $47,000. 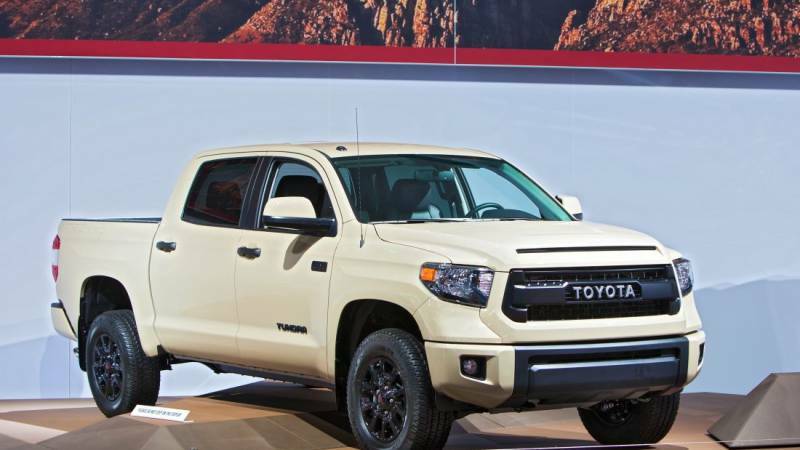 Depending on the powertrain configuration, the Tundra Platinum carries a comparable price tag. The Toyota Tundra’s 4.6L i-Force V8 engine produces up to 310 horsepower and 327 pound-feet of torque. To handle tougher tasks, you’ll need the 5.7L i-Force V8 engine that’s rated at 381 hp and 401 lb-ft of torque. Both trademark engines come with stainless steel exhaust manifolds with 4-2-1 configurations. The Acoustic Control Induction System minimizes noise at the beginning of each combustion cycle. With an electronically controlled design, a six-speed automatic transmission is standard in the Toyota Tundra. With some assistance from the Sequential Shift Mode, you can easily switch gears. Navigating elevated terrains is made easy with the Uphill/Downhill Shift Logic technology. Compatible only with the 5.7L engine, the Tow/Haul Mode may be activated with the touch of a button. Speaking of towing, this Toyota is strong enough to handle a trailer that weighs just under 11,000 pounds. This powerful truck also has a maximum payload rating of approximately 2,100 pounds. Rear-wheel drive with an automatic limited-slip differential is standard in the Tundra. For optimum off-road performance, you should opt for the 4WD system that comes with Active Traction Control. An electronically controlled transfer case is included in this sophisticated 4WD installation. Four-piston brake calipers also deliver superb stopping power on rough terrains. With a ground clearance of 10.4 inches, this robust Toyota truck can confidently roll over rocks and other uneven surfaces. Toyota’s engineers should be praised for integrating the Dual Independent Variable Valve Timing with intelligence technology into the i-Force engines. This patented mechanism improves efficiency during the intake and exhaust of air. Despite its powerful design, the 5.7L V8 engine is available in the Flexible Fuel Vehicle (FFV) version that’s compatible with E85 fuel. The Tundra offers a fuel economy of 19 MPG on the highway and 15 MPG in the city. When you fill the vehicle’s 38-gallon fuel tank, you won’t have to stop at another gas station for about 720 miles. The Entune infotainment system in the Toyota Tundra includes a 7-inch touch screen. You can use the built-in GPS navigation software to get reliable guidance. Additional help is provided by the Connected Navigation Scout GPS Link App and live traffic feeds on HD Radio. The Entune App Suite has many other features such as Destination Search, OpenTable and Yelp. This signature portal offers access to popular music services including SiriusXM Satellite Radio, iHeartRadio, Slacker and Pandora Internet Radio. Up to 12 JBL speakers can be installed to play your favorite songs on these premium radio channels. Siri Eyes Free and wireless Bluetooth give you other options to connect smartphones with the Entune platform. Installed in the vehicle’s instrument cluster, the 3.5-inch multi-information display delivers important data such as fuel economy, driving range and trip time. By toggling through the virtual menus, you can customize this digital display, which also shows the shift position indicator. Featuring a voltmeter and engine coolant temperature, the analog instrumentation gauges in this Toyota truck are illuminated with a soft glow. The Toyota Tundra has the bragging rights of being the first vehicle in its class to have the Blind Spot Monitor. This radar-based technology scans for any cars that might be quickly approaching you from behind. When there’s an elevated risk of a side collision, the BSM issues a blinking warning in one of the side mirrors. Similarly, the Rear Cross Traffic Alert helps you safely handle this truck in reverse. 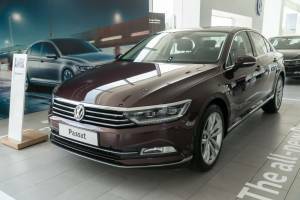 With the optional front and rear parking assist, it is simple to precisely handle this vehicle in narrow parking spaces and driveways. The parking assistant is powered by multiple sensors that use sonar waves to scan the surroundings. Just like most Toyota models, the Tundra comes standard with the Star Safety System. The Smart Stop Technology works in sync with the Brake Assist to help you decelerate this vehicle on a short notice. With some leverage from the Vehicle Stability Control, you’ll stay on your intended path, even in inclement weather. As a pickup truck that’s designed by a Japanese brand, the Nissan Titan can be fairly compared with the Toyota Tundra. With a starting price of just under $30,000, the Titan costs slightly less than the Tundra. Rated at 390 hp and 394 lb-ft of torque, the 5.6L Endurance V8 engine matches the capabilities of the 5.7L i-Force V8 engine. In the technology department, the NissanConnect suite is very similar to the Entune platform. Additionally, the Titan’s 12 Rockford Fosgate speakers offer great sound quality, just like the 12 JBL speakers in the Tundra. When compared with the Ford F-150, the Toyota Tundra gets beaten in some categories. 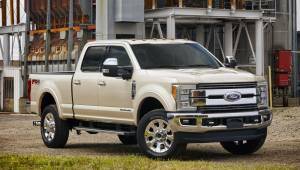 For instance, the Ford is available with five engines, including the High-Output 3.5L EcoBoost V6 engine that offers more than 500 lb-ft of torque. The F-150 also boasts advanced driving aides such as the Pro Trailer Backup Assist. The Ford’s 8-inch productivity screen is also easier to see and manage than the 3.5-inch digital display in the Tundra’s instrument cluster. Also, Toyota’s Entune system is very similar to Ford’s SYNC 3 infotainment system.